For most couples, a wedding is the first time they will have to think about planning such a huge event, and it can be overwhelming not knowing where to begin. 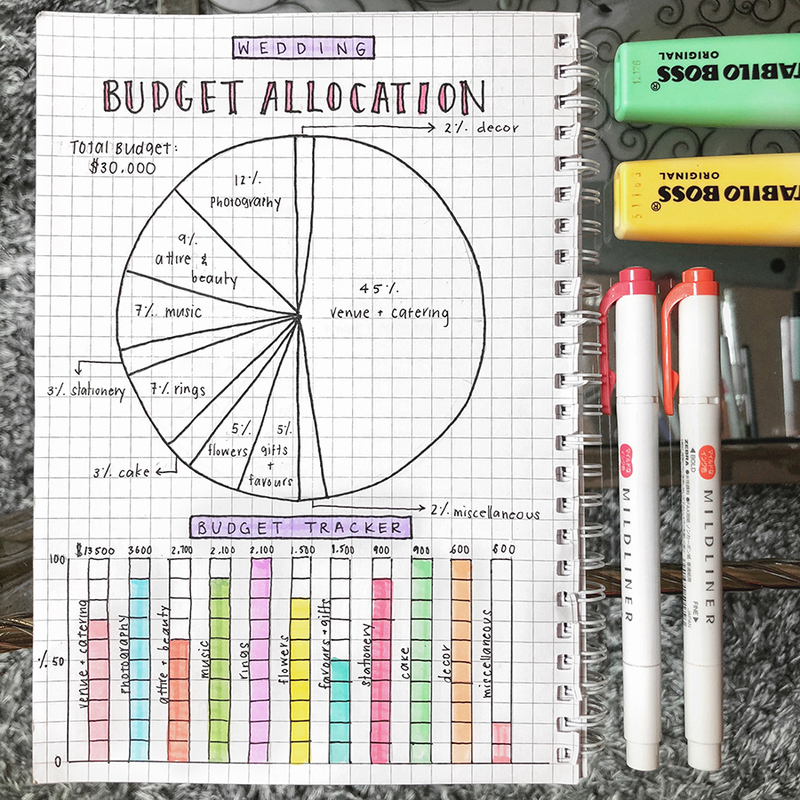 Your budget is a pretty good place to start, because once you’ve fixed your budget, it can help ensure that you don’t overspend throughout the rest of the planning process. 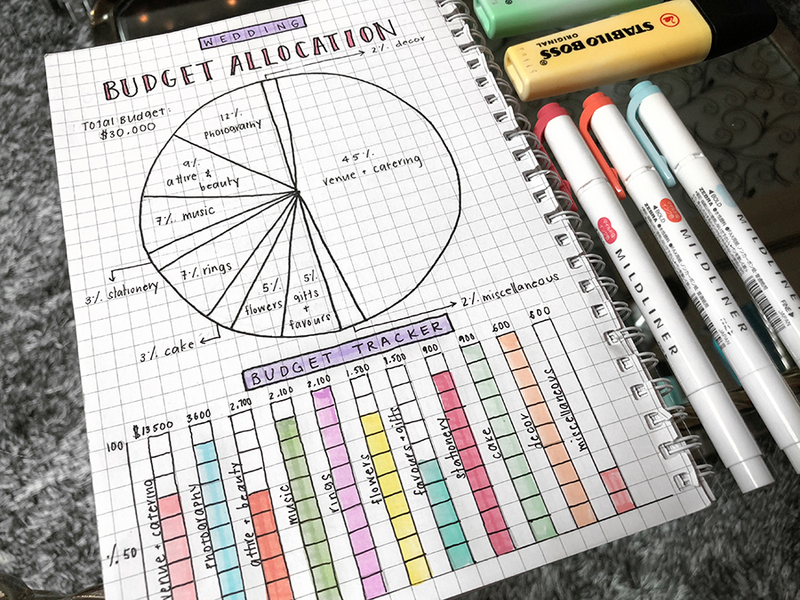 Today we are sharing how bullet journalist, Yuka, from Lust That Bujo sets up a budget allocation and tracker spread in a bullet journal! Bullet journals are not only a great way to keep yourself organized in a personalized and creative way, but also to document different phases of your life including your wedding planning process. When it comes to something like a wedding, it’s nice to have a keepsake you can look back at one day to remember all the hard work you’ve put in for your special day. 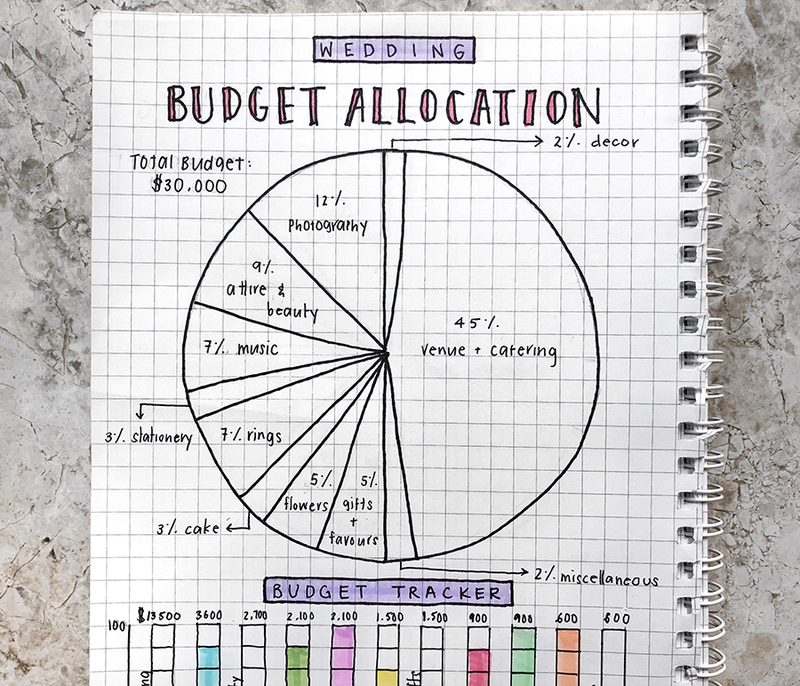 This budget allocation and tracker spread is a brilliant tool for you to plan-out and visualize your budget for your wedding. 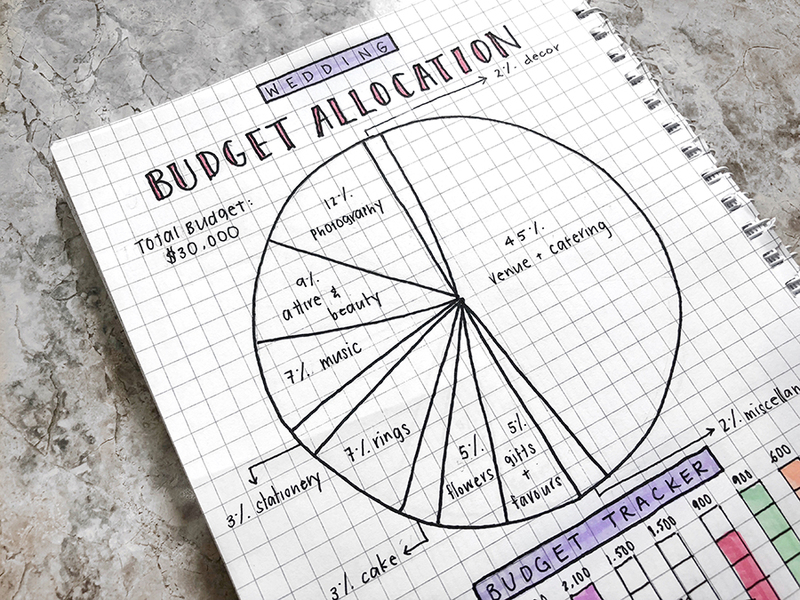 The budget allocation pie chart requires just a few simple steps. Sit down with your partner and consider the total budget you are willing to spend on your entire wedding. Come up with a list of different parts of your wedding that your total budget will need to be divided into. Examples include: venue and catering, photography, attire and beauty, décor, music, stationery, rings, cake, flowers and gifts and favours. You can add to this list or remove categories depending on your needs and wants for the wedding. 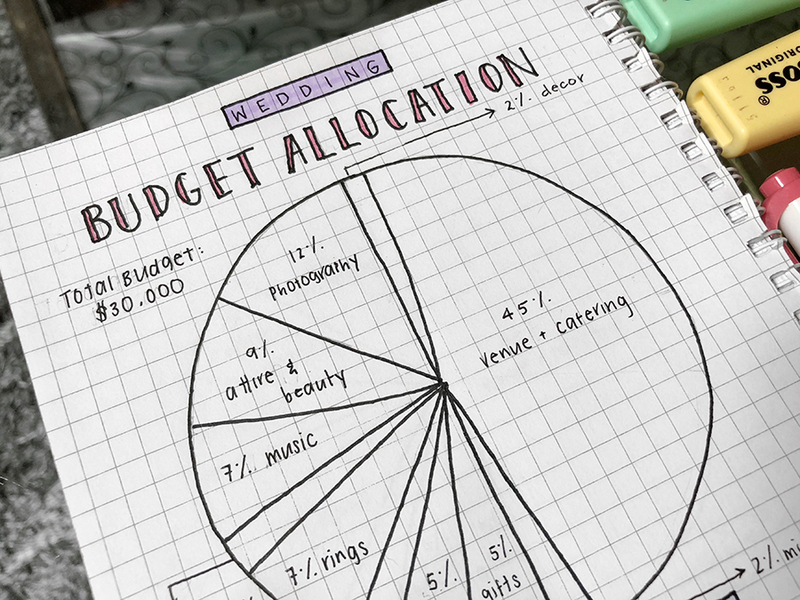 Every wedding is different, so everyone’s budget allocation chart will be a little different too! 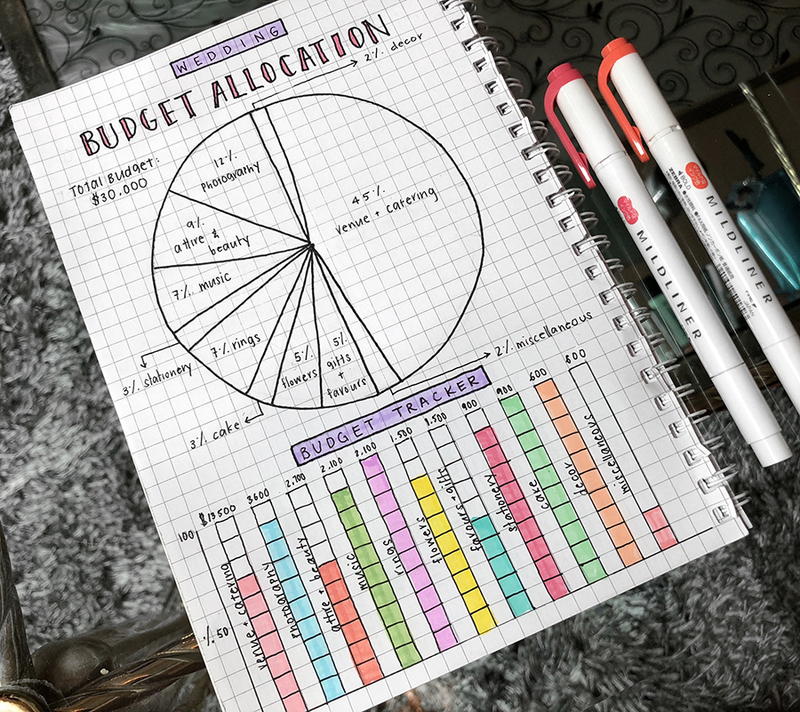 Once you’ve come up with a list that you’re both happy with, divide each category into a percentage of your total budget depending on how much you’re willing to spend for that category. It’s important to do some research at this stage too, so you know what to expect in terms of what is a realistic budget for each category. Draw it up into your preferred visual chart (here we’ve used a pie chart) along with the percentages and each of the allocated categories. The pie chart doesn’t have to look perfect so long as it serves its purpose of allowing you to visualize your budget. In fact, most bullet journalists prefer their journals to look more roughly drawn and authentic. 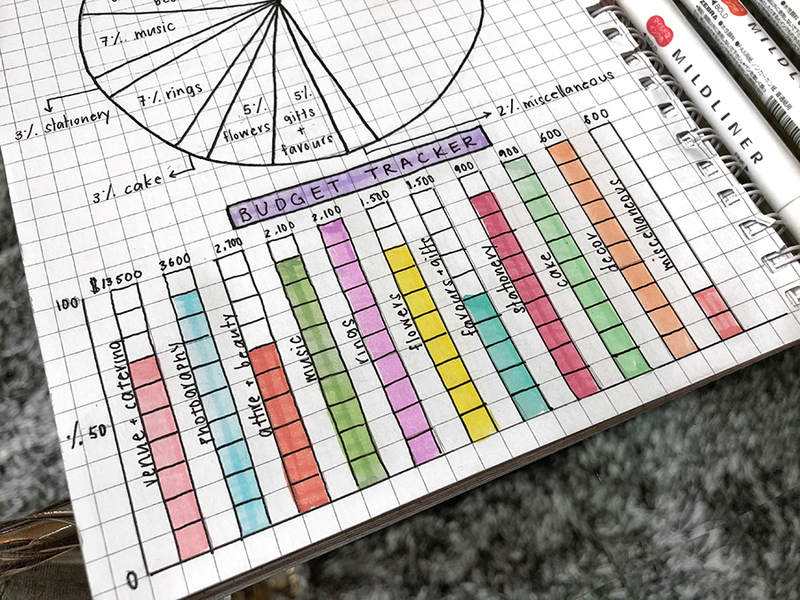 It’s what makes a self-created bullet journal unique to any other type of store-bought journal! The second part to this spread is the budget tracker. This part of the spread is progressive, meaning that once you’ve completed the basis of it, you’ll continue to fill it in leading up to your wedding day. Ensure that all categories you identified during the budget will fit in the available space. Draw out a horizontal axis and a vertical axis (the vertical axis should go up to 10 squares/dots/cm/lines depending on what type of notebook you’re using). The vertical axis will depict the percentage of the total budget per category. Draw out a vertical bar for each category. Calculate how much your budget is for each category based on the percentage allocation you identified. Write it down above each bar. To use your tracker, shade in your bar every time you’ve spent money on a particular category. For example, if you spend $6,750 (or anywhere around this mark) for venue and catering (which you’ve allocated $13,500) shade in 50% of your bar. 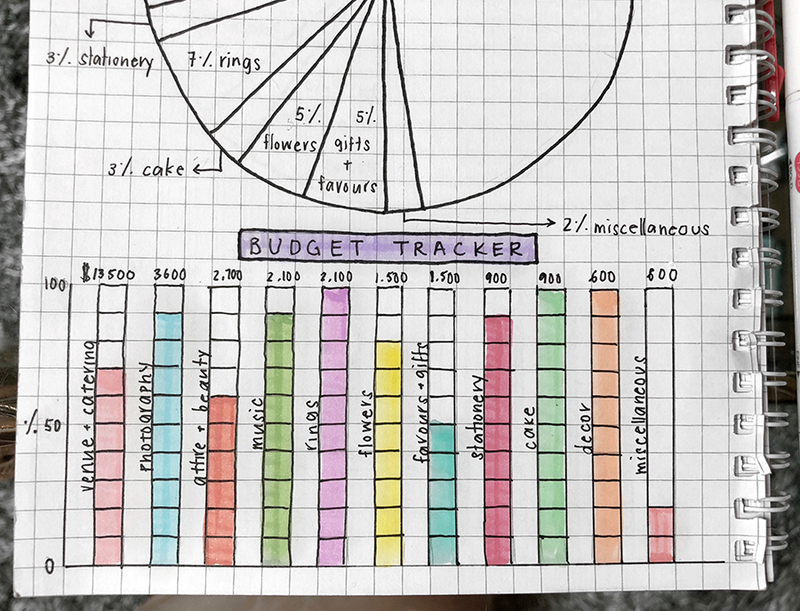 Remember to continue to update your tracker every time you spend on your wedding to avoid going over your budget. Happy wedding planning, Wedding Scoopers! Looking for a notebook to start your bullet journaling journey? 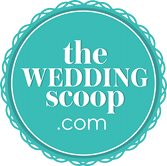 Look no further, we created The Wedding Scoop’s Wedding Notebooks for Brides & Grooms just for you.